Sony Glass Sound Speaker is a Bluetooth speaker and table lamp in one | What Hi-Fi? Sony’s Life Space UX series is reserved for products and devices that “create a new kind of living experience”. We’ve already seen 4K ultra-short throw and portable projectors, but the company’s latest addition is a Bluetooth speaker disguised as a light. The Glass Sound Speaker looks like an LED light at first glance, but the glass cylinder actually doubles up as a tweeter that emits 360 degree sound. Sony has fitted three actuators extending from the base of the cylinder to roughly a third of the way up it. These then vibrate the glass to create sound. Underneath the metal base of the cylinder you’ll find a built-in 2in woofer that takes care of midrange frequencies and on top of the cylinder there’s a translucent passive radiator for low frequencies. You can connect to the Glass Sound Speaker via Sony’s LDAC Bluetooth technology, which claims to transmit around three times more data that conventional Bluetooth for better quality audio, or via a 3.5mm auxiliary connection. Two Glass Sound Speakers can be paired together to create a stereo pair and each speaker promises around four hours of battery life. You control music playback using Sony’s SongPal app for iOS and Android devices. 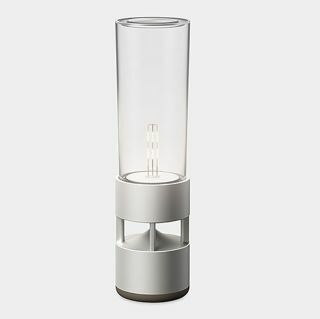 Inside the glass cylinder is an LED light, the brightness of which can be adjusted. It also conveniently disguises the speaker as a regular table lamp. The Sony Glass Sound Speaker is available exclusively from the Museum of Modern Art (MoMA) store in New York for $800.